Sounds like a great sew along. You can count me in. I definitely need to get over my fear of sewing trousers, and it might take me forever, too, lol. But perhaps we’ll all muddle through together. I’m not on twitter though, do I have to be on twitter to join in? What patterns are you thinking of? Shopaholic has a good pant pattern I’ve heard. Too chicken to try…I may have to reconsider! 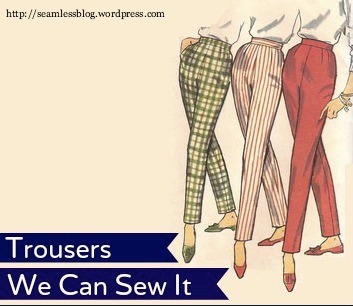 I’m thinking of the Colette trouser pattern, but I’ll take a look at Sewaholic’s – thanks! Ooooh, yes, trousers. My nemesis. I’m in! I love your Rosie the riverter button you made. Perfect!! I was not so much scared as quietly failing and taking things very slowly with sewing trousers for the longest time—but not anymore! And come on, having pants (to us Americans) that finally fit is about the best thing ever! I recommend copying a pair that fits you well, and then tweaking the fit from there, that’s what finally worked for me. Also, you may already know this but Sunni from A Fashionable Stitch has a great trousers fitting series which I found really helpful. Good luck and keep up the positive attitude—you’re right of course, we can make whatever we want! My 2013 nightmare 🙂 – sewing – no problems – fitting – hrrrr…. Anyway I am planning to go on with my trousers project so why not together 🙂 – I am in! I’m trying to make S4044 but got flustered at the crotch adjustments. 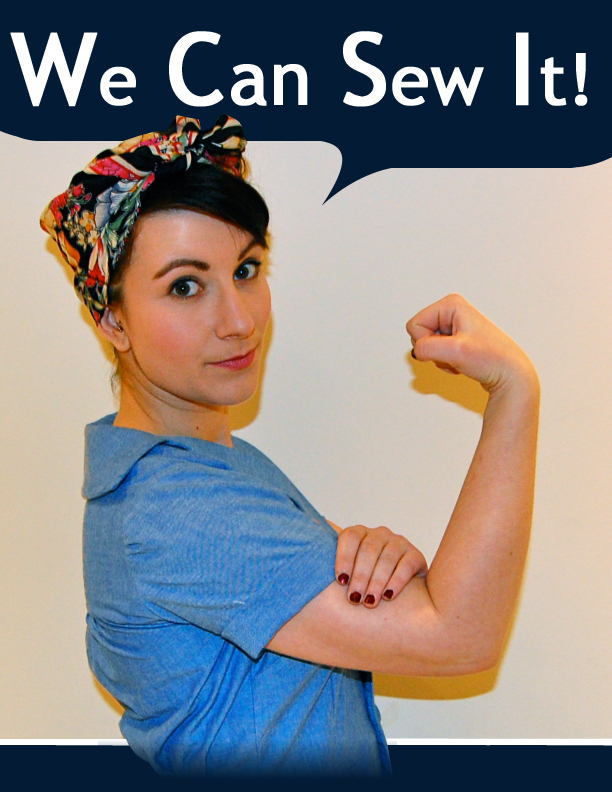 I have ordered “Sewing pants that Fit” on the recommendation of other sewing bloggers who conquered trouser fitting! I never wear trousers so will not join on this sew along, but will keep an eye on any others coming next and might join you. Good luck! Hey, I’ve only made two pairs of trousers, it seemed a bit scary but I have a bit of pattern feedback for you that might help…These http://isthathomemade.wordpress.com/2013/04/27/very-near-completion-and-very-long/ which were simplicity 2700 amazing fit trousers and it was easy to get it a good fit but it took me two goes to get the zip in right. I have also made these http://isthathomemade.wordpress.com/2013/09/29/complete-burda-jeans/ which are not such a good fit but VERY easy to make, its Burda 8488. Amazing! Thanks for that Ali, much appreciated.